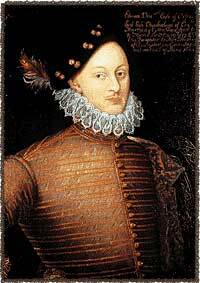 Edward de Vere, 17th Earl of Oxford, was born on 12 April, 1550, at Castle Hedingham in Essex. Because his father died when he was a minor, the new earl became a royal ward. The wardship system involved his lands being used by the crown for its own profit, although ostensibly to the ward's benefit. He received legal training at Gray's Inn after having attended Queen's College, Cambridge, and was awarded Master of Arts degrees by Oxford and Cambridge universities. In 1571, at the age of twenty-one, Lord Edward regained control of his estates and married Anne Cecil, daughter of Lord Burghley, for 40 years the Queen's Principal Secretary of State and later Lord Treasurer, in whose house he had been placed for his education during his minority. The marriage, although it produced three surviving daughters, was not happy; Anne died in 1588. Their three remaining daughters, Elizabeth, Bridget and Susan, would marry into the nobility, the latter to the Earl of Montgomery, one of two noblemen to whom William Shakespeare's First Folio was dedicated. De Vere was, in his earlier years, a favourite at court, where he seems to have mostly lived when young. At 25, he undertook a tour of France, Germany and Italy in 1575 and was abroad for some sixteen months. The Earl flirted with Catholicism but in late 1580 he denounced a group of Catholic friends to the Queen, accusing them of treasonous activities and asking her mercy for his own, now repudiated, Catholicism. He was retained under house arrest for a short time and, following the birth to Anne Vavasour of an illegitimate child fathered by him in 1581 (Sir Edward Vere), was briefly in the Tower of London. The birth of this child led to a long-running feud with Sir Thomas Knyvett, uncle of Anne Vavasour, which resulted in the deaths of three followers of De Vere and Knyvett as well as injury to both men. During the early 1580s it is likely that the Earl lived mainly at one of his Essex country houses, Wivenhoe, but this was sold in 1584. After this it is probable that he followed the court again and passed some time in his one remaining London house. Both William Webbe (A Discourse of English Poetrie, 1586) and George Puttenham (The Arte of English Poetrie, 1589) ranked him first among Elizabeth's courtier poets, and some two dozen poems are signed or ascribed to De Vere in manuscript or published form. De Vere's poetry first appeared in the 1576 publication of The Paradise of Dainty Devices, then in The Arte of English Poetrie (1589), The Phoenix Nest (1593), England's Helicon (1600) and England's Parnassus (1600). In 1622, Henry Peacham (The Complete Gentleman) would list De Vere as first among the poets of the Elizabethan period. Given the public praise of contemporaries extending over 35 years, it is likely that De Vere's poems represent but a sampling of his total output. As an experimental lyric poet, De Vere used 11 different metrical and stanzaic forms in the two dozen poems, including fourteener couplets, the English sonnet, tetrameters, and trimeters. De Vere was also active as a dramatist at this time. Though none of his masques and plays survive, he wrote plays of a quality to be cited by Francis Meres (Palladis Tamia, 1598) for comedy and interlude, being praised by Meres as "the best among us for comedy." Throughout the 1580s, De Vere maintained a band of tumblers as well as two theater companies, Oxford's Boys and Oxford's Men. The former company played at the Blackfriars Theater in London, the lease of which Oxford purchased and transferred to playwright and novelist John Lyly, his secretary for more than 15 years, and at Paul's Church, until it was closed in 1590. Oxford's Men was a troupe of actors which mostly toured the provinces. Evidence of De Vere's lifelong interest in learning were the numerous contemporary tributes to his patronage. Among the 33 works dedicated to the Earl, six deal with religion and philosophy, two with music and three with medicine, but the focus of his patronage was literary, for 13 of the books presented to him were original or translated works of literature. Authors dedicating works to De Vere include Edmund Spenser, Arthur Golding, Robert Greene, John Hester, John Brooke, John Lyly, Anthony Munday, and Thomas Churchyard, the latter three writers all having been employed by De Vere for various periods of time. According to Anthony Wood, another of his secretaries was the English scientist, Nicholas Hill. His extensive patronage and possible mismanagement of estates led to the sale of all his inherited lands, inhibiting the formation of a local power base and possibly precluding high office, though De Vere was briefly given military commands in 1585 in Holland and in 1588 during the Armada. In 1586, to rescue him from penury, the Queen granted the Earl an annual pension of £1,000. In the early 1590s, he married his second wife, Elizabeth Trentham, one of the Queen's maids of honour. Their only child, Henry, heir to the earldom, was born in 1592. By this time he was deeply in debt and had lost all his inherited estates. He died in June 1604, probably from plague, at King's Place in Hackney, located in the London suburb of Stratford. He left no will and is presumed buried in St Augustine's church in the same parish. Contemporary testimony that he may be buried elsewhere is provided by Percival Golding, the youngest son of Arthur Golding, the uncle of De Vere. Golding wrote twenty years after De Vere's death that the 17th Earl "died at his house at Hackney in the month of June 1604 and lies buried at Westminster [Abbey]." The only biography of Edward de Vere was written in 1928 by Bernard M. Ward. In 1920 the Earl of Oxford was put forward as the true author of the works of William Shakespeare by J. Thomas Looney in his Shakespeare Identified in Edward de Vere, 17th Earl of Oxford. In 1975, the Encyclopedia Britannica (15th edition) commented that, "Edward de Vere became in the 20th century the strongest candidate proposed for the authorship of Shakespeare's plays." Text ©1999 Gary Goldstein. All Rights Reserved. Published by express written permission. Created by Anniina Jokinen on June 3, 1999. Last updated on April 17, 2009.